After that, we launched into the topic which is how to accurately find the tension. For next month members are asked to make some accurate 15cm squares of knitting so we can create blankets for a homeless charity. Next month we will be learning to crochet the squares together. 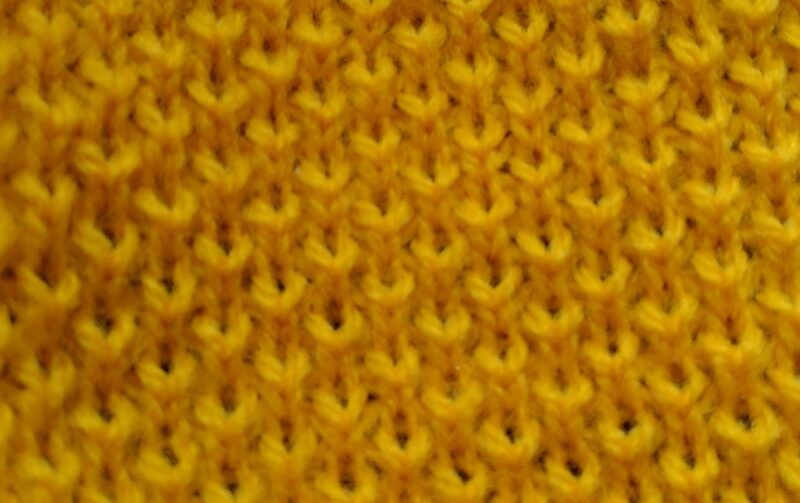 The squares should be in a variety of stitches – not just plain stocking stitch. 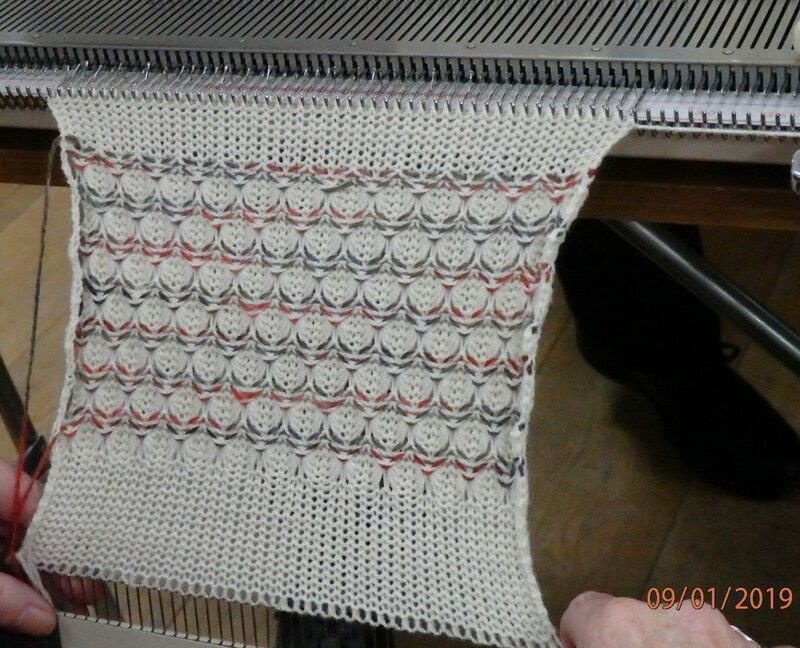 Margaret reviewed how to do a tension swatch and showed us her samples. 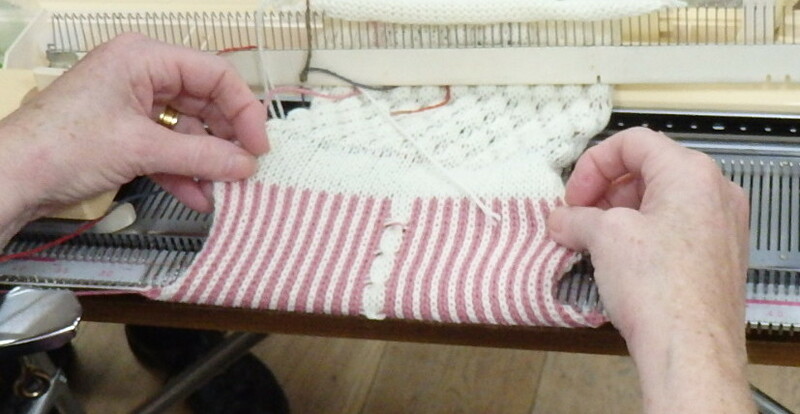 There was a discussion on using various techniques – the green and blue rulers (for Silver owners) then a method using a set number of rows and stitches and working the tension from that. Then how to work out the number of rows and stitches needed to get a 15cm square. Some people like to use a charter to avoid any calculations, others like to use a calculator or mental arithmetic method. Tricia described how to best calculate the number of rows and stitches to match a pattern – she liked a garter stitch babies jumper but has not got a garter carriage and didn’t have the yarn given in the pattern. She described in detail and showed us her handwritten working sheets with all the notes and diagrams. Other members had used similar methods and some had alternatives. We then had a show and tell – quite a few people had been busy over the Christmas period. April had made a bag full of fingerless mitts for charity. 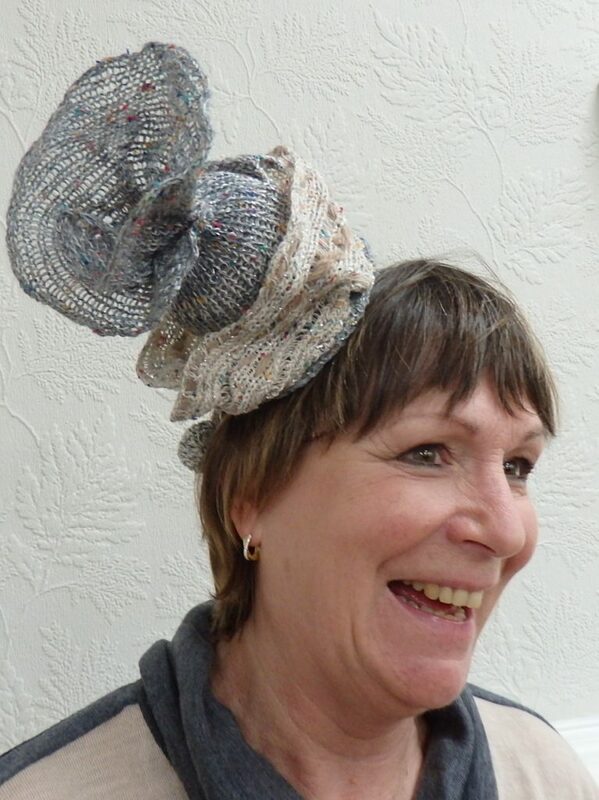 Angie brought along a super hat knitted in wire, she had made this for a project at Morley College, the brief had been the planets. Hers represented the colours of Mercury meets Jupiter. 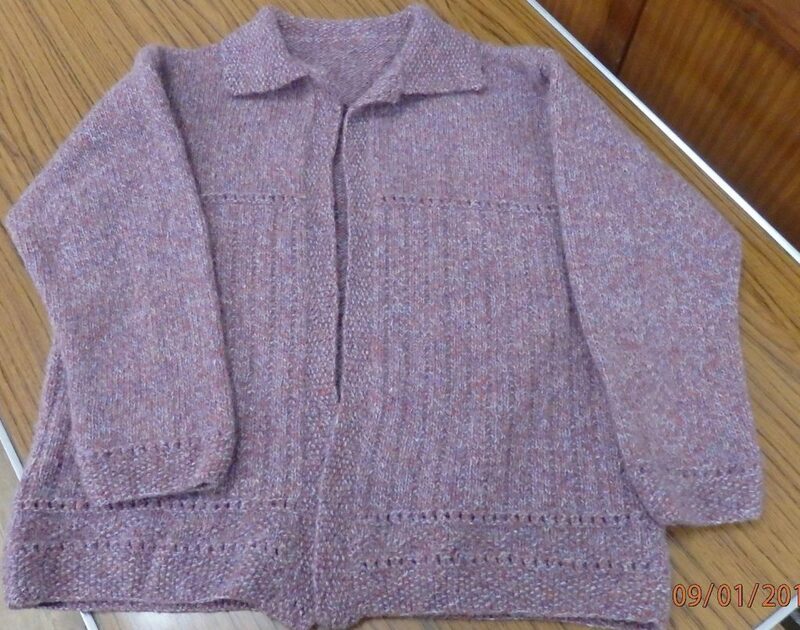 Gill had hand knitted a jacket in Shetland wool. After coffee, Frances demonstrated a technique combining two different stitches. One punch card had 4 rows tuck pattern followed by 2 rows of weaving. It made a very attractive fabric. She show a sample of alternate tuck and slip using a 1×1 card, which made a firm fabric. After that she showed an example of fairisle with a blanked off section where she places a cable design. 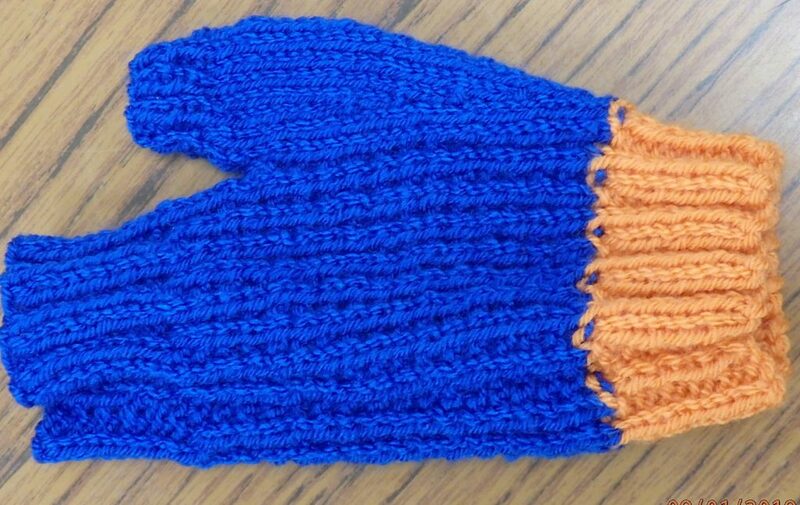 There were two techniques – a simple twisted stitch over 3 needles using two 3 pronged tools and another narrow cable.